End-of-life vehicles (ELV) generate million tonnes of waste in the European Union every year. Directive 2000/53/EC (Directive 2000/53/EC – the “ELV Directive”) on end-of life vehicles aims at making dismantling and recycling of ELVs more environmentally friendly. It sets clear quantified targets for reuse, recycling and recovery of the ELVs and their components. It also pushes producers to manufacture new vehicles without hazardous substances. Use the links below to get more information or contact us directly (SEDA Team). 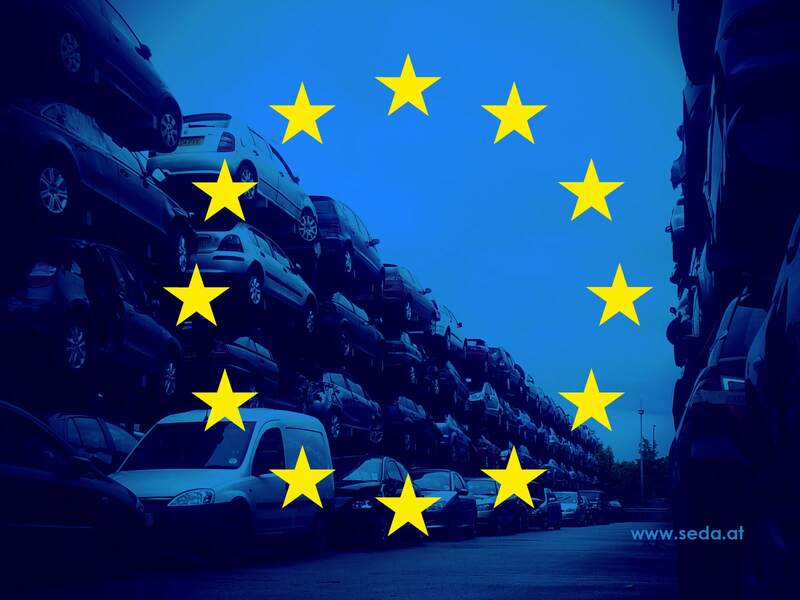 The European Union (EU) wishes to limit the production of waste arising from end-of-life vehicles and to increase re-use, recycling and other forms of recovery of end-of-life vehicles and their components. In order to achieve these two objectives, the EU lays down new requirements for European vehicle manufacturers, who should design vehicles which are each to recycle. develop the integration of recycled materials. Since 1 July 2003, the use of mercury, hexavalent chromium, cadmium and lead in the components of vehicles placed on the market has been prohibited. However, these substances may be used for certain applications if the use of these substances is unavoidable (see Annex II to the Directive 2000/53/EEC). Member States shall establish collection systems for waste arising from vehicles. Furthermore, they shall ensure end-of-life vehicles are transferred to authorised treatment facilities. The owner or holder of the end-of-life vehicle shall receive a certificate of destruction when the vehicle is transferred to an authorised treatment facility. This certificate is issued by the facility. It enables the owner or holder to deregister the vehicle with the public authorities. The costs or part of the costs incurred in transferring a vehicle to a treatment facility shall be met by the vehicle manufacturers. Member States shall organise the storage and treatment of end-of-life vehicles in accordance with the requirements of the Framework Directive on Waste and those of Annex I to the Directive. Authorised treatment facilities shall strip end-of-life vehicles before treatment and recover all environmentally hazardous components. Priority must be given to the re-use and recovery (recycling, regeneration, etc.) of vehicle components. The aim of this Directive is to increase the rate of re-use and recovery. 95 % no later than 1 January 2015. 85 % no later than 1 January 2015. For vehicles produced before 1980, the targets are lower. Member States must ensure that producers use material and component coding standards. These standards allow identification of the various materials and components. They, therefore, facilitate dismantling. The Commission is responsible for establishing European standards. In so doing, the Commission shall take account of the work going on in relevant international forums. Vehicle manufacturers are required to produce information on dismantling for each type of new vehicle placed on the market. This information must be produced within six months of the vehicle being placed on the market. the progress made in the field of recovery and recycling. Member States shall submit a report to the Commission every three years based on this information. Each report shall be in the form of a questionnaire drawn up by the Commission. These questionnaires shall enable the Commission to observe any possible changes in the structure of motor vehicle dealing and of the collection, dismantling, shredding, recovery and recycling industries. Within the nine months following receipt of the reports from Member States, the Commission shall publish a report on the implementation of this Directive.